The Avventura is based on Fiat’s hatchback Punto although it comes with some unique styling and design features of its own too. The Fiat Avveentura has been made available with 3 trims namely Active Dynamic and Emotion and will also be available with both diesel and petrol engine options. The new Crossover is available in both diesel and petrol drivetrains, the price for the base Diesel variant starts at INR. 6.85 lakh(ex-showroom, New Delhi) while the top-of-the-line petrol variant is priced at INR. 9.85 lakh(ex showroom, Delhi). The Fiat Avventura Urban Cross comes with the same powertrain shared by the standard Avventura. It is powered by a 1.4-litre T-Jet petrol engine paired with a 5-speed manual gearbox which churns out 140 PS of peak power at 5500 rpm and 210 Nm of peak torque between 2000 rpm to 4000 rpm. The engine is peppy and kicks out enough power for this car to run on urban road smoothly, while an occasional off roading trip in the weekend will not be bad we guess. 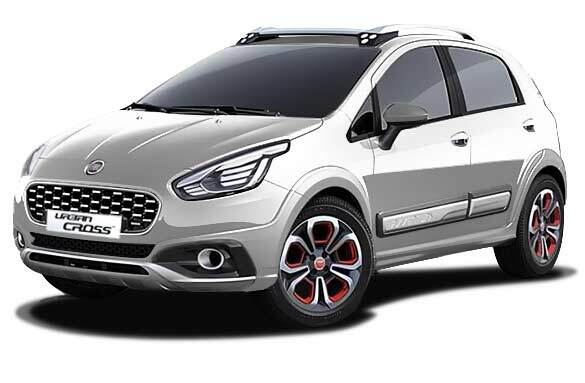 Although Fiat Avventura comes with a 1.3-litre Multijet diesel engine option under the hood, it is not sure whether the Avventura Urban Cross will be sold with the diesel engine or not. The Urban Cross comes with the tried and tested 1.3-litre MultiJet diesel engine and the 1.4-litre T-Jet petrol (which powers the Avventura Abarth). We first started with the 1.4-litre T-Jet and it’s quite an exciting engine to drive and this one doesn’t disappoint one bit. The car looks like a very efficient off road capable car. Moreover, the 24.3 km pl of fuel economy of Vitara Brezza is much better than Avventura Urban Cross’s 14.4 km pl even better than the diesel powered Avventura engine which delivers 20.5 km pl. The new Avventura comes with a few cosmetic updates. As of Interior in fascia, You will find laid back large headlamp clusters which feature LED daytime running lights. The front grille is exactly shaped like the Fiat Avventura. Additionally, it features chrome garnishing. The front bumper looks muscular as well, with sleek air intake featuring honeycomb mesh grille, black accents surrounding the fog lamps. It also features skid plate at the front bottom. The side profile sports 17-inch sporty alloy wheels with red inserts. Apart from that the side turning indicator integrated wing mirrors, silver painted side body cladding, sporty roof rails enhance the appeal. The rear profile features LED integrated tail lamps positioned vertically and just beside the rear windscreen. Also, there is a roof spoiler and skid plate at the rear. As of Interior, It comes with a dual tone theme, which is sporty. Among the features it gets multifunction three spoke steering wheel, four round dials at the instrument cluster with two large dials and two small ones. The centre console looks a bit unusual. At the middle of the centre console the car sports a touchscreen infotainment screen with piano black accent surrounding it. Standard features in the interior include central and automatic door locks, ‘smart’ power windows with ‘delay’ and ‘auto-down’ functions. For the entertainment of the passengers inside the Crossover gets a Smartech music system with 5-inch touch screen. This infotainment system integrates navigation which is standard across all its variant, the other features include Bluetooth audio streaming and also telephony. With a lot of refinements and modifications, the New Avventura showcases that it was well engineered and designed as per standards. Moreover, it also excels in all aspects and departments of its futuristic Technology among its predecessor. Finally, by this vehicle Fiat withhold its position in the auto-market in which the fiat deserves to be.